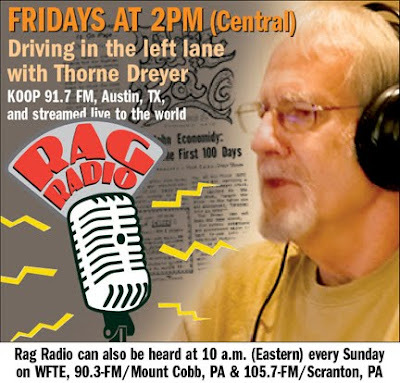 The Rag Blog: Jim Turpin : Is the United States a 'Banana Republic'? 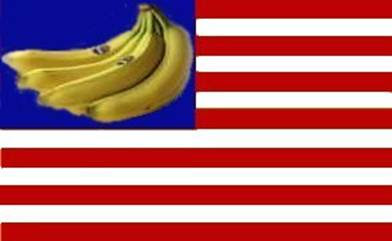 Jim Turpin : Is the United States a 'Banana Republic'? ba•nan•a re•pub•lic (noun) A small country that is economically dependent on a single export commodity or on outside help, and is typically governed by a dictator or the armed forces. “Banana republic” was first used by author William Sydney Porter (“O. Henry”) in Cabbages and Kings (1904) while residing in Honduras after hiding out for allegedly embezzling funds from the First National Bank of Austin in 1894. As part of the “War on Terror," the Obama administration continues the draconian national security “policies” of George W. Bush. These include indefinite detention at CIA “black sites” and at Guantanamo, “evidence” produced through torture, post acquittal “detention power," and military commissions or tribunals with severely limited “due process." This list barely touches the full complement of tools used by our government to flout the rule of law. Key among these is the use of torture and detention for both U.S. citizens and foreign nationals. The abuses at Guantanamo and other “black sites” are well known: water boarding, sleep deprivation, stress positions, humiliation, and degradation. But what is not as well known is that this has happened to U.S. citizens and the “evidence” produced is admissible in military commissions. procedures deviating from the traditional rules of the Uniform Code of Military Justice (UCMJ). Among other shortcomings, the MCA rejects the right to a speedy trial, allows a trial to continue in the absence of the accused, delegates the procedure for appointing military judges to the discretion of the Secretary of Defense, allows for the introduction of coerced evidence at hearings, permits the introduction of hearsay and evidence obtained without a warrant, and denies the accused full access to exculpatory evidence. Canadian Omar Khadr was 15 years old when picked up and accused by the U.S. government of planting roadside bombs and killing a U.S. soldier with a grenade in Afghanistan in 2002. Critics cast his trial as the first of a so-called "child soldier" in modern Western history. They argue that Khadr should have been given special treatment, including rehabilitation, and not shipped from Afghanistan to the prison camps where he was held for year as an alleged teen terrorist among adult "enemy combatants." He still remains untried after nine years at Guantanamo and will likely never be tried or released. U.S. citizen Jose Padilla was arrested in 2002 for providing “material support to terrorism” and for training in the use of radiologic weapons in the Afghanistan-Pakistan region in 2001 and early 2002. He was then deemed an “enemy combatant” and held in a military brig in South Carolina without notice to family or attorney. Padilla was held for five years and alleges torture including sensory and sleep deprivation, stress positions, and the administration of the hallucinogenic drugs LSD and PCP. Padilla was convicted in 2007 and is serving a 17-year sentence. Though this program existed long before the Obama administration, the ordered assassinations of U.S. citizens by the executive branch due to an “unspecified threat” seems beyond the pale for most Americans and citizens of the world. It is alarming to hear that the Obama administration is asserting that the president can authorize the assassination of Americans abroad, even if they are far from any battlefield and may have never taken up arms against the U.S., but have only been deemed to constitute an unspecified "threat." This is the most recent consequence of a troublingly overbroad interpretation of Congress's 2001 Authorization for the Use of Military Force. This sweeping interpretation envisions a war that knows no borders or definable time limits and targets an enemy that the government has refused to define in public. This policy is particularly troubling since it targets U.S. citizens, who retain their constitutional right to due process even when abroad. I actually can't believe that there is even a "debate" over whether an American President -- without a shred of due process or oversight -- has the power to compile hit lists of American citizens whom he orders the CIA to kill far away from any battlefield. The notion that the President has such an unconstrained, unchecked power is such a blatant distortion of everything our political system is supposed to be -- such a pure embodiment of the very definition of tyrannical power -- that, no matter how many times I see it, it's still hard for me to believe there are people willing to expressly defend it. The citizen in question is Anwar al-Awlaki, a U.S. citizen born in New Mexico in 1971 and a Muslim cleric accused of orchestrating terror attacks from Yemen. In December 2010 a federal judge dismissed a challenge to the Obama administration's targeted-killing program, meaning the U.S. can continue to go after a Yemeni-American cleric whom it blames for terrorist plots. The case, brought by the father of cleric Anwar al-Awlaki, raised difficult questions about the breadth of U.S. executive power, but U.S. District Judge John Bates said he couldn't answer them as the father lacked legal standing to bring the case. The "serious issues regarding the merits of the alleged authorization of the targeted killing of a U.S. citizen overseas must await another day or another (non-judicial) forum." Rep. Dennis Kucinich (D-OH) tried in August of 2010 to pass a bill that prohibits extrajudicial assassinations, but failed to get enough votes. The Congressman stated: “The U.S. government cannot act as judge, jury, and executioner." As a response to Richard Nixon’s propensity to spy on political and activist groups which blatantly violated the Fourth Amendment (unreasonable search and seizure), the Carter administration passed the Foreign Intelligence Surveillance Act (FISA) in 1978. The act was created to provide judicial and Congressional oversight of the government's covert surveillance activities of foreign entities and individuals in the United States, while maintaining the secrecy needed to protect national security. It allowed surveillance, without court order, within the United States for up to one year unless the "surveillance will acquire the contents of any communication to which a United States person is a party." If a United States person is involved, judicial authorization was required within 72 hours after surveillance begins. In the period 1979-2006 a total of 22,990 applications for warrants were made to the Court of which 22,985 were approved (sometimes with modifications; or with the splitting up, or combining together, of warrants for legal purposes), and only five were definitively rejected. This means that only .02% of submitted governmental FISA requests were denied by the court. ...the law meant to “update” FISA instead gutted the original law by eviscerating the role of the judicial oversight in government surveillance. The law also gave sweeping immunity to the telecommunications companies that aided the Bush administration’s unconstitutional warrantless wiretapping program by handing over access to our communications without a warrant. For those who regularly write and read about civil liberties abuses, it's sometimes easy to lose perspective of just how extreme and outrageous certain erosions are. One becomes inured to them, and even severe incursions start to seem ordinary. Such was the case, at least for me, with Homeland Security's practice of detaining American citizens upon their re-entry into the country, and as part of that detention, literally seizing their electronic products -- laptops, cellphones, Blackberries and the like -- copying and storing the data, and keeping that property for months on end, sometimes never returning it. Worse, all of this is done not only without a warrant, probable cause or any oversight, but even without reasonable suspicion that the person is involved in any crime. It's completely standard-less, arbitrary, and unconstrained. There's no law authorizing this power nor any judicial or Congressional body overseeing or regulating what DHS is doing. The plutocrats of this country are not just doing well, they are exceeding levels not seen since the wealth gap that was created right before the Great Depression. In 1928, the top 0.01% of U.S. families averaged 892 times more income than families in the bottom 90%. By contrast, in 2006 the top 0.01 percent averaged 976 more income than America’s bottom 90 percent. Inversely with wealth increasing, tax rates have plummeted for the rich. Taxpayers making more than $1 million in 1944 paid 65% of their total income in taxes. In 2005, those making $1 million faced a top marginal rate of 35% or 23% of their income in federal taxes. Let’s not forget that the Obama administration, with a majority in both the House and Senate, caved to the Republican party in December 2010 by continuing the ruinous Bush tax cuts for the wealthy. He helped ramrod a tax cut for the uber-rich that added $900 billion to the over $14 trillion U.S. national debt. This was not well received by some Democrats, but passed anyway and was hailed as bipartisan cooperation. Congratulations. Each man, woman and child in the U.S now owes around $45,000 to eliminate the national debt. Go ahead and add that to your mortgage, credit card, and college debt which exceeds annual disposal income by 122.5%. In other words, you are enslaved permanently to massive debt. But who has done well in the last 15 years? Well, if you are a CEO, your pay has increased +298.2%, while production workers have had a +4.3% increase and federal workers have had their pay fall by -9.3%. But don’t worry, corporations have had a +106.7% profit increase since 1990. Go figure. You don’t have to be a math genius to figure out that huge tax cuts along with a massive increase in spending causes a huge national deficit and federal debt. The majority of U.S. debt is held by foreign countries via U.S. Treasury bonds. These bonds are held primarily by Asian countries (China, $907 billion, and Japan, $877 billion) but also by other foreign powers including the United Kingdom ($477 billion) and oil exporting countries ($214 billion). This has caused concern that these controlling foreign entities may have not only economic but also political control of the United States policies with vast control of our national debt. So where are your tax dollars going? 54% of federal tax dollars go to military spending (36% to current military operations to the tune of $965 billion and 18% or $484 billion for past military spending including vet benefits and interest on national debt borrowing). The government typically “cooks the books” and underestimates military spending by including trust funds (i.e. Social Security) and the expenses of past military spending as not distinguished from non-military spending. It seems that one major export we have for the world is endless war. To date, the total cost of the Iraq and Afghanistan wars is $1.26 trillion. This obscene amount has been approved over and over again, by both Democrats and Republicans since 2001, including the $33 billion war supplemental in August 2010. This war is bought and paid for by both parties. Nobel economic laureate Joseph E. Stiglitz predicted that by the time the U.S. leaves these two conflicts we will have spent over $3 trillion and we may well exceed this amount when factoring in the national debt, the current economic crisis and the rising cost of oil. So the question remains… are we now the mythical “banana republic” Anchuria that O. Henry created in Cabbages and Kings? It seems to me we don’t even rate with Anchuria... or Belgium for that matter.